[UPDATE] See my March 31, 2014 item, My letter today requesting Prometheus Books to retract my father's "gross distortion of Vietnamese and U.S. history"
(Yesterday, Dr. Henry) Heimlich, 94, released his autobiography, "Heimlich's Maneuvers'' (published by Prometheus Books). 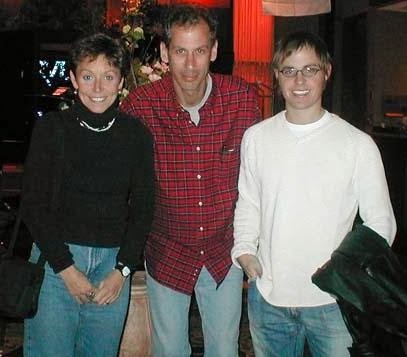 ...Heimlich's son, Peter Heimlich, writes a blog, on which he has spent years trying to draw attention to his father's "wide-ranging, unseen history of fraud." Sometimes my father's scams are so obvious it's difficult to believe anyone would fall for them, certainly not a publisher like Prometheus Books, founded by the late Paul Kurtz, a prominent debunker of junk science. I remember another incident in which I was overcome with emotion. It occurred in February 1993, when I was invited to accompany a team of twenty cardiac and thoracic surgeons to Vietnam, a trip arranged by the citizen ambassadors of People to People International...In Hanoi, our plane was met by a contingent of North Vietnamese cardiac and thoracic surgeons. The head of the Vietnamese delegation introduced each member of our team until he came to me. “Dr. Heimlich, you need no introduction,” I remember him saying. 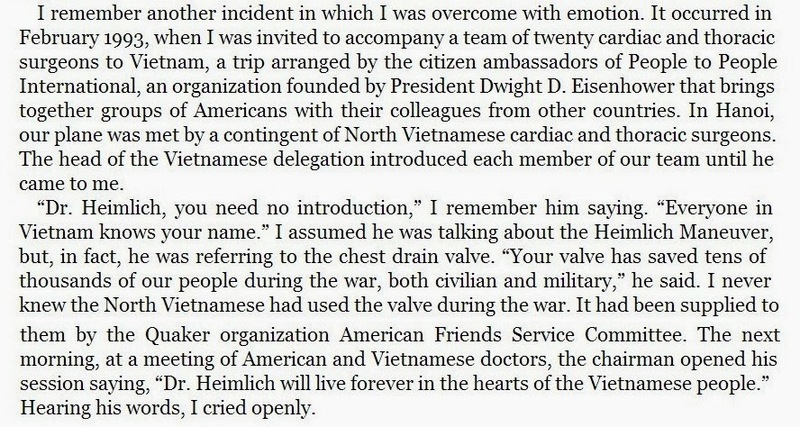 “Everyone in Vietnam knows your name.” I assumed he was talking about the Heimlich Maneuver, but, in fact, he was referring to the chest drain valve. 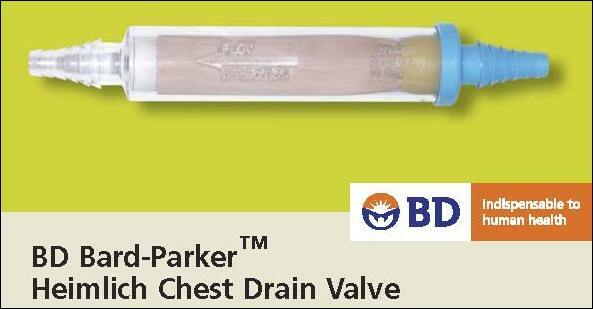 “Your valve has saved tens of thousands of our people during the war, both civilian and military,” he said. I never knew the North Vietnamese had used the valve during the war. It had been supplied to them by the Quaker organization American Friends Service Committee. The next morning, at a meeting of American and Vietnamese doctors, the chairman opened his session saying, “Dr. Heimlich will live forever in the hearts of the Vietnamese people.” Hearing his words, I cried openly. Reading my father's words, I sighed openly. Apparently the editors at Prometheus are unfamiliar with the Trading with the Enemy Act and/or didn't stop to consider the consequences of a U.S. organization allegedly providing medical supplies to an enemy army and population during wartime. Apparently they also don't read Radar Magazine. Eight years after being busted for a preposterous lie that distorts Vietnamese and U.S. history, and which implies that the AFSC and Heimlich valve manufacturer Becton, Dickinson and Company committed treason, it's unclear why my father continues to tell the story. It's also unclear why Prometheus Books was willing to publish it. I'll try to get answers to those questions and will report the results in a follow-up. This item has been revised.